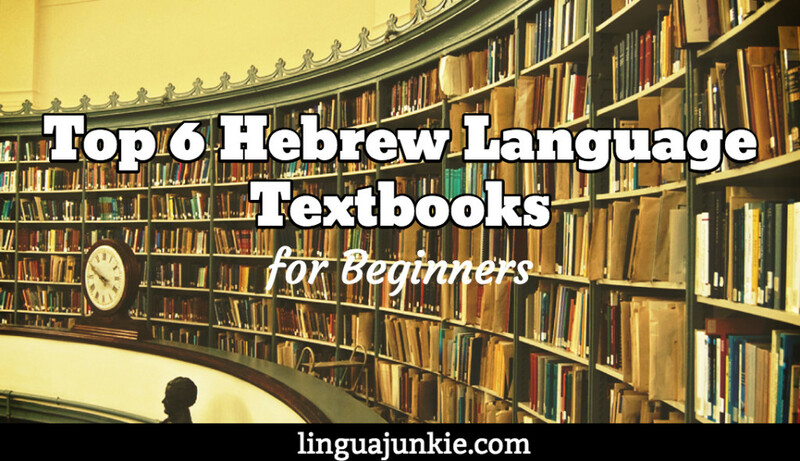 September 5, 2015 by The Junkie 1 comment on "Top 10 Hebrew Textbooks & Books for Beginners"
So… what’s so great about textbooks in an age of internet articles and apps? A Hebrew textbook gives you structure – a path, from Page 1 to 200. It teaches you the alphabet, grammar, writing, reading and everything that you won’t learn from reading articles online. I know you’ve read enough already. Here’s a list of 10 useful Hebrew books for beginners. Click on them to learn more & Please share this if you find it useful! All books have links so click on them to learn more at Amazon. Links are my Amazon affiliate links. This is a massive bargain and a great way to start Hebrew. It includes 9 CDs and 3 Books (Essential, Intermediate, and Advanced). Excellent package for self study and tons of practice material with answer keys. You’d end up with a B2-C1 level of Hebrew if you stick with it. This book focuses only on reading but is definitely the BEST one for complete beginners. 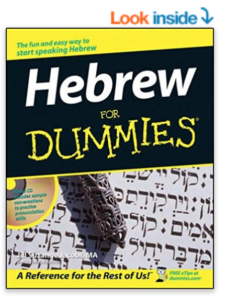 In 92 pages and 10 lessons, you’re taught to read Hebrew without boring technicalities. It’s quick. Direct. To the point. There are also practice exercises inside. Not Biblical Hebrew. This is a clean, simple and logical approach to Modern Hebrew. You start off with the seven verb groups and master them and the conjugations. (Verbs are crucial to Modern Hebrew). By the end, you can create fairly complex sentences and recognize patterns in Hebrew. Note: This needs to be used with other books which help with vocabulary, phrases and reading practice. You can only do so much with grammar. 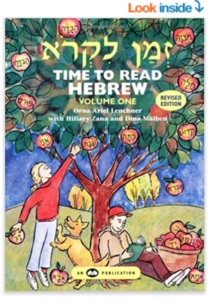 Great for children… and even better for adults (because Hebrew isn’t easy)! This is a small 32 page book and a simple introduction to Hebrew. You learn common vocabulary via words and pictures. The pages are broken up into subjects (family, weather, clothing, etc) with both the Hebrew and English. Perfect as a first book. Want to master grammar? This is the Hebrew textbook for you. The Routledge Introductory 384 page textbook is designed to take you from beginner to advanced and gives you A LOT of practice to improve fast in each chapter. The author always touches back on things you’ve learned which is great review. Lots of dialogue examples so you’re not reading rules all day. Grammar aside, this book helps a lot with speaking and real communication. You MUST know the alphabet for this one. This 243 page textbook gets you reading sentences and paragraphs from page 1. Lots of grammar tips and vocab lists presented with every reading. Overall there are 9 units and you be reading and writing at a good level. I recommend this one. If you’re not a beginner, be sure to look for Level Two on Amazon. Maybe you’re not looking for textbooks. If you want easy phrase books that are not as dense as textbooks, then check these out as well. If you’re going to travel or just need a reference book, you may like it. Phrases are divided by categories like “Food,” “Ordering at Restaurants,” “Words for Traveling,” “Health” and much more. You also get a 3,500 Hebrew-English dictionary inside. I think it’s useful to have it and review it once in a while. Don’t judge this book by its title. This is definitely the friendliest and one of the most approachable “learn Hebrew books” out there. But there’s small “but.” All Hebrew words here are written in English so you will not learn the Hebrew alphabet. Across 362 pages, you’ll learn words, phrases and conversations for topics like Greetings, Small Talk, Eating, Shopping, Telling Time, Asking for Directions, Emergencies and much more. You also get a Hebrew CD with audio so you can listen to the conversations. Teachers and professors don’t like this book for how casual and non-academic it is, Normal, everyday people like me like it. Want to a step-by-step guide for the Hebrew alphabet? 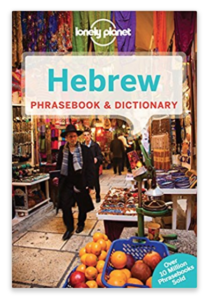 With this 84-page Hebrew book, as the title promises, you learn how to read and write Hebrew. The book has templates and practice sheets for writing out the characters and quizzes to test you on the letters. It feels like it’s made for kids, and probably is, but it will definitely help you as well. Ton of Hebrew learners are learning for the Bible. So, it makes sense to include this book here. 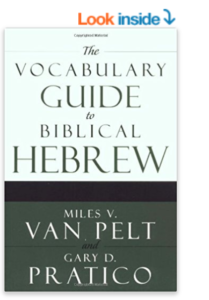 Across 334 pages, you’ll learn the most common Biblical Hebrew words used in the Bible vocabulary. And, all of the relevant grammar and rules related to these words. Use it as a reference book to get acquainted with the words and conjugations. I also recommend HebrewPod101 (click here!) for their Audio and Video Lessons. Yes, it’s no textbook, but it just might be the best online course for speaking, listening and mastering real Hebrew conversation. That site would be a perfect supplement with whatever Hebrew textbook or dictionary you’re using. Check it out and decide on your own. Do you have any Hebrew textbook that you swear by and recommend? I’ll add more as I go along. Leave a comment!